Lightning McQueen - from the Disney/Pixar Cars movies! Features a die-cast metal body, a detailed engine, and undercarriage detail. It even replicates the unique wheel motion seen onscreen! Includes 3 optional expression windshields, 3 optional bumpers, and a mirrored stand. As seen in the hit Disney/Pixar Cars movies, spectacular Lightning McQueen arrives with a die-cast metal body, a detailed engine, and undercarriage detail. It even replicates the unique wheel motion seen onscreen! 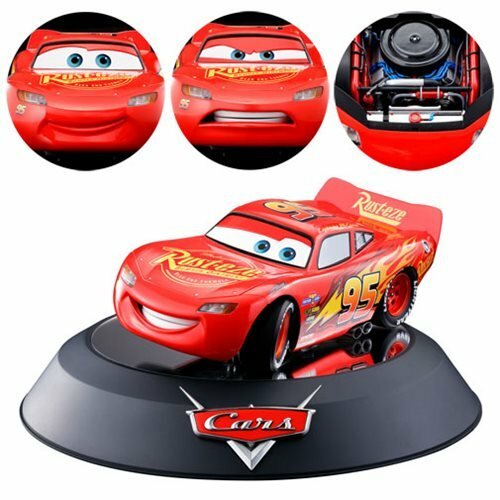 The Cars Lightning McQueen Chogokin Die-Cast Metal Vehicle comes with 3 optional expression windshields, 3 optional bumpers, and a mirrored stand. It measures about 7 9/10-inches long. This is ultimate Lightning McQueen model!